This is where conditionals come into play. 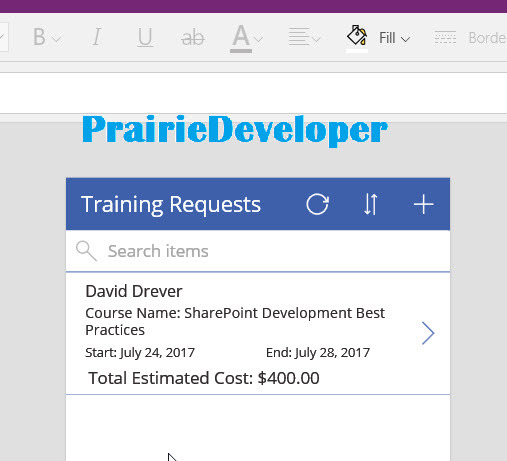 Like all programming languages, PowerApps allows you to use conditional statements to control objects. If…then…else, switch statements, etc are all available to allow you to conditionally manipulate your environment. In this case I want to use conditionals to control how the text will appear. Pretty straight forward once you get going. 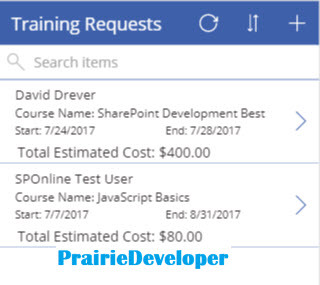 In my previous post I discussed how to create a new PowerApp directly from a SharePoint list. I also indicated it had a few limitations that needed to be addressed. One of these limitations was the default browse screen is not compatible with lookup type fields (People\Groups, Choice, Lookup, etc). These field types are of course available in the details and edit screens, but not the browse screen. I can force the control to look at the field I want, but it doesn’t know how to convert the object into text. Luckily there are formulas that can help us out here. 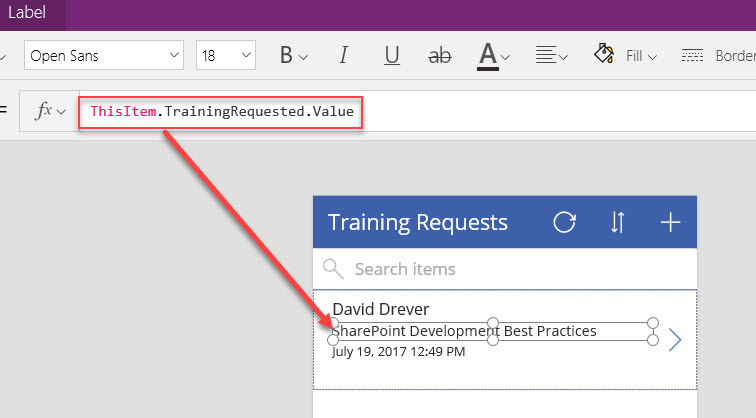 To display the name of the user PowerApps has the ability to call the DisplayName property of the field. To get the title of the training requested is just another property of the field. I decided to get a bit fancier and add some text at the beginning of the value to add to the experience. I wanted the field to read: Course Name: <“Name of the Course”>. To do this, you simply combine two strings together (the can be variable based or static (what you typed)) inside a Concatenate function. Concatenate("Total Estimated Cost: ", Text(ThisItem.TrainingCost, "[$-en-US]$#,###.##00")) //The #,###.##00 format indicates to put a comma at every thousand, ten thousand etc, //and the 00 at the end indicate to add trailing zeros if none exist. //and the 00 at the end indicate to add trailing zeros if none exist. 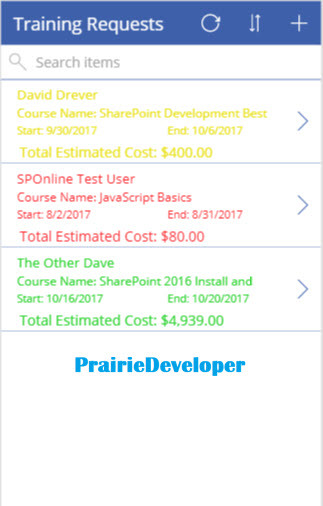 PowerApps is still pretty new, but there is a lot you can do with it. I look forward to seeing where it will get to in the near future.